"Enemy to those who make him an enemy! Friend to those who have no friends!" 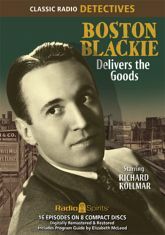 Broadway favorite Richard Kollmar stars as Boston Blackie, the former safecracker with a heart of gold who became a tough-guy private investigator. He is aided and abetted by Lesley Woods as girlfriend Mary, and Maurice "The Mysterious Traveler" Tarplin as Inspector Faraday. Blackie's cunning (and his underworld contacts) help him through sixteen exciting cases of robberies and kidnappings, mix-ups and murders, bad luck and quality goods.